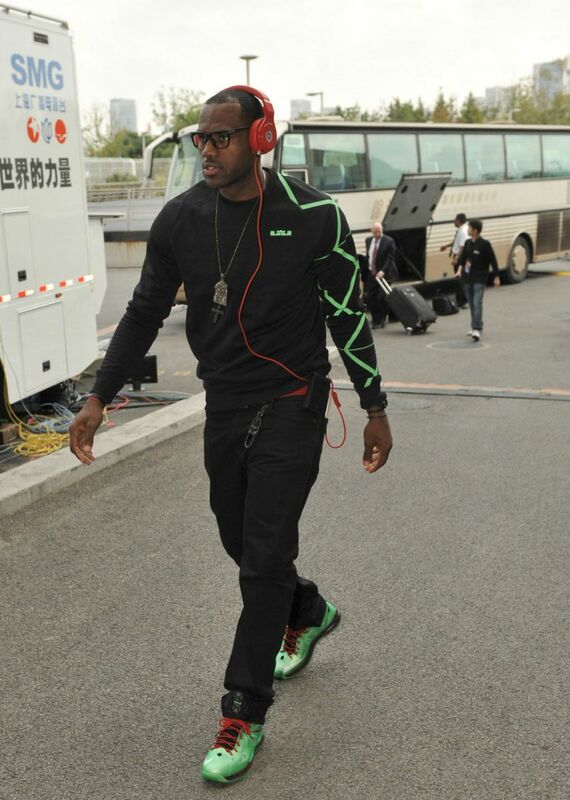 LeBron James Wears Nike LeBron X "Cutting Jade"
While teammate Dwyane Wade announced a new partnership with Li-Ning, LeBron James used the China Games platform to debut his tenth signature sneaker under Nike Basketball. While teammate Dwyane Wade announced a new partnership with Li-Ning, LeBron James used the China Games platform to debut his tenth signature sneaker under Nike Basketball. It was the "Carbon" colorway that actually hit the court on Sunday, but James arrived at Shanghai's Mercedes Benz Arena wearing the China-inspired "Cutting Jade" make-up with a matching sweatshirt. We know how you feel about the shoes, but is the sweatshirt something you'd pick up to go along with your pair?